The word “sandbox” is starting to elicit a reaction from me that sits somewhere in the foul territory between an outbreak of hives and cold sweats. If there was ever a genre of game that was overdue for a drought, it’d be sandbox games. This isn’t to say that I haven’t been enjoyed a game based around the premise of punching a tree until it dispenses enough wood for you to build a house with (repeatedly), but the fact is that there’s an excess of those types of games on the market and honestly, they’re not all that different from one another. Citadel: Forged With Fire is trying to break that mould by throwing its players into a fantasy setting complete with dragons, necromancers, and a whole lot of magic. Citadel’s early access appears to be open to everyone on Steam for the price of around $20 bucks. Because of that, there’s been a steady stream of people willing to try it out, and the developers (Blue Isle Studios) has been quick enough on the uptake regarding patches and putting in fixes according to the community’s feedback. However, as this is an early access game, there are a number of bugs and features that have yet to be ironed out. They don’t ruin the game per se; some are actually quite entertaining, but it might be worth flagging for Blue Isle that its work is more enjoyable when it, well, doesn’t work. The premise behind Citadel is pretty simple - it takes all the bog standard fantasy RPG parts that people have ooh’ed and aah’ed over in titles like Skyrim and throws them into a giant sandbox. 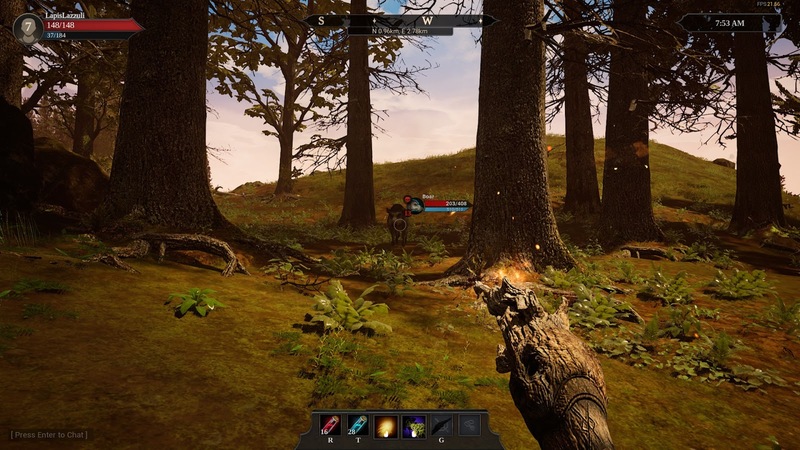 While there’s definitely an element of survivalism in it, it’s not the sort of game that throws you into the wilderness with some rags on your back and cackles as another player beats you to death with a rock as soon as you log in. Atmospherically, Citadel takes a lot of cues from Western fantasy RPGs, even down to the navigation banner at the top of the screen and the sort of baddies that roam around the world. 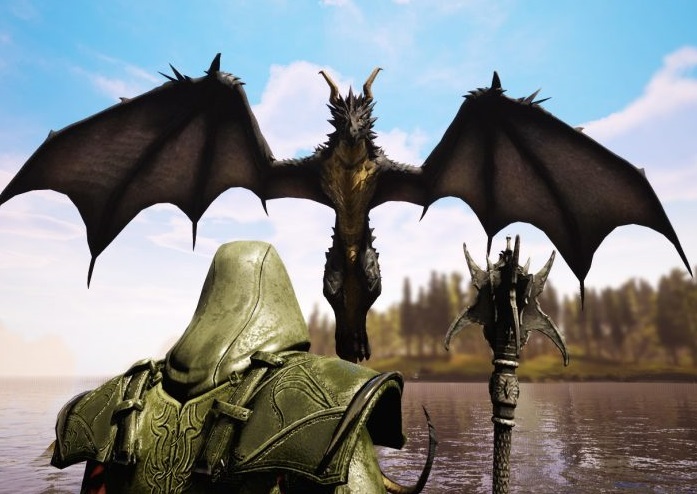 There’s plenty of opportunities to capture amazing landscape screenshots, and wildlife look great and react decently organically to you traipsing around with a flaming staff. Hell, even if they stood still and lectured me about accidental arson I’d probably be happy; fantasy games don’t have to play by the realism rulebook. However, some of the other mechanics feel more mundane than magical. For a land that appears to be rife with magic and the fantastical, you’re still going to have to punch trees and rocks for a decent part of the game to get resources. You start to develop a little more sophistication once you learn the spell to extract resources from just about anything around you, but that’s about where the buck stops when it comes to using magic in a novel way. Sure, you’re a big bad wizard, but I’m not quite sure if a sandbox PVP game is quite the space to explore that sort of characterisation or fantasy. Crafting doesn’t exactly make use of magic either, unless you count the fancy bit of UI wizardry that allows you to instantly mesh things together once you’ve got the right blueprints (acquired via leveling up and not exploration) without having to so much as look at how each part gets crafted. I’d have appreciated being able to have a bit more of a window into things like crafting and building via the use of magic, especially since the fantasy aspect has been heavily touted as something unique and original. I agree that it is a different spin on things, but I need to see more of it in action to be convinced. As with other early access games, there are always little hiccups when it comes to players actually accessing content. I realise that almost nobody is going to play a sandbox game for the story, and that’s totally fine, but being shunted onto PVP servers (and having to re-level each time you entered a new server) at the start when the game’s official PVE servers were almost constantly down or had connection errors was more than a little frustrating. When I finally did make it onto a PVE server, the latest patch had resulted in a hilarious bug where no monsters would actually attack you. For any reason. As a result, I slowly singed a dragon and a lich to death over time without any retaliation, and it was probably the most fun that I’ve had with the game to date. However, it isn't exactly what you'd call an exciting game of combat if one side refuses to participate. Citadel is a game that has the benefit of a good concept and the developers have clearly put out an early access product that feels mechanically sound. However, "mechanically sound" only means so much when there aren’t that many mechanics for players to actually engage in. This is the sort of game that you need to enlist some mates for in order to get the most mileage. Without some company, it’s just hours upon hours of picking up flowers and farming the various monsters that rear their head every now and again, and at times are about as aggressive as a field of corn at that. Magical shenanigans are always fun, but if I wanted to slay a dragon and loot some herbs, I’d rather do so with some sort of concrete narrative goal in mind. Minecraft fans, you can have this one.